NelsonHall, a leading industry analyst within business process outsourcing (BPO), has again pointed out Zalaris as a leader in providing cloud-based multi-process HR outsourcing services. This recognition is another proof Zalaris that has achieved the position as a European player. "I am pleased to see that this recognition differentiates us as one of the strongest cloud-based multi-country payroll players in Europe”, says Zalaris CEO Hans-Petter Mellerud. 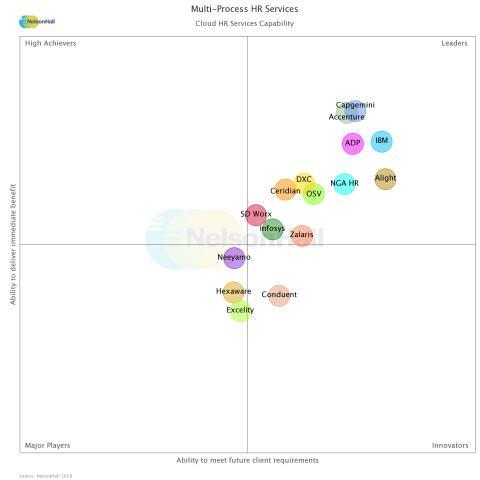 NelsonHall’s Vendor Evaluation & Assessment Tool (NEAT) analyses the performance of vendors offering multi-process HR services and their capabilities across a range of criteria and business situations as well integration to Workday and SAP SuccessFactors. “Zalaris was cited as a leader in the cloud HR services segment due to their proven ability to deliver immediate transformational benefits to customers, while being well position to meet their needs in the future. With many European headquartered enterprises seeking HR transformation partners, Zalaris is well positioned for growth, particularly with organizations seeking to transform payroll, which is a core capability for Zalaris.” says Pete Tilliakos, senior HR research analyst with NelsonHall. With Zalaris’ go-to-market strategy intact Zalaris is now a one-stop HR shop for European organizations seeking cloud-based HR services, including cloud consulting, deployment of SAP SuccessFactors employee central and talent management modules, ongoing application maintenance and support as well as comprehensive transactional HR business process outsourcing support. “In the end its about people change and not the rapid change of HR tech. HR must be able to deliver a compelling employee experience to ensure total workforce productivity, including the external workforce. That’s our role and how we can deliver immediate value.” says Mellerud. NelsonHall is the leading BPS and ITS research firm. The company takes a global approach to analysis of vendors and outsourcing markets and is widely respected for the quality and depth of its research. With its “Speed-to-Source” methodology, including its NEAT vendor evaluations, NelsonHall is helping buy-side organizations significantly reduce the time and cost associated with BPS and ITS sourcing projects. Learn more at www.research.nelson-hall.com. Industry leading analyst NelsonHall has named Zalaris as a leader in the market for the third year in a row, this time for its position in next generation payroll services. 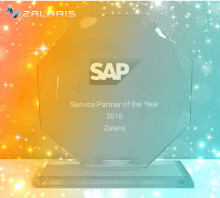 Zalaris is proud to announce that the software giant SAP has awarded Zalaris as “Service Partner of the year 2018”. This acknowledgement reflects the company’s hard work to continuously develop value to both customers and collaborators through SAP services like SAP SuccessFactors and SAP HCM.